by Rob Mott, Ridgeway Radio CIC Company Secretary. 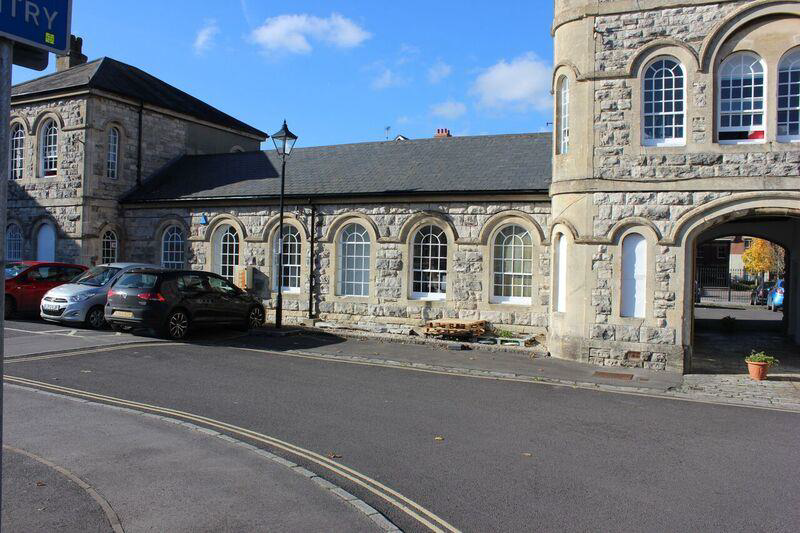 On Tuesday the 24th of October we took possession of our proposed studio complex at the famous and historic Little Keep in Dorchester located at the rear of the military museum. This week with the help of Kieran Williams, Andy Worth and John Williams we installed most of the equipment for the larger studio (studio 1), we also installed an intruder alarm, the data wiring and the audio wiring between the studio and the rack system. We also ran the cables up to the top flat roof of the building for the Sky news dish and microwavelink that will connect the studio to the transmitter site on the Ridgeway and provide a link to the DCH Hospital studio. A big thanks for your help guys. I am very pleased to report the Sonifex S2 studio mixer is working well and seems to be very easy to operate and has turned out to be a very flexible and useful addition to our equipment list. We havealso installed a duel CD player, the 2 studio Mics and stands and a duel telephone balancing unit that will enable us to have 2 phone lines connected to the main studio desk. 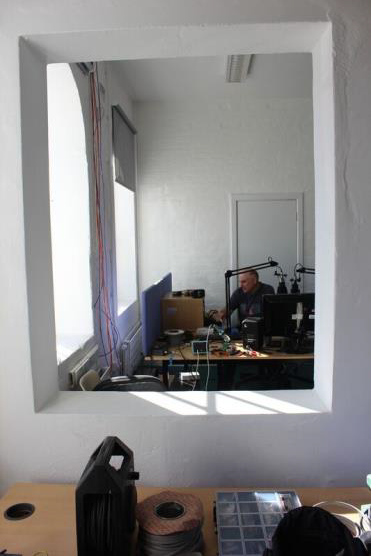 I am now looking at the cost of phone lines and high speed internet connectionsso that we can broadcast on line from the new studios. As part of the deal we have with our landlords we have access to the internet via wifi throughout the Little Keep building. We also have the use of 2 well equipped kitchens one of which has a large table that seats about 8 to 10 people so this is ideal for meetings. 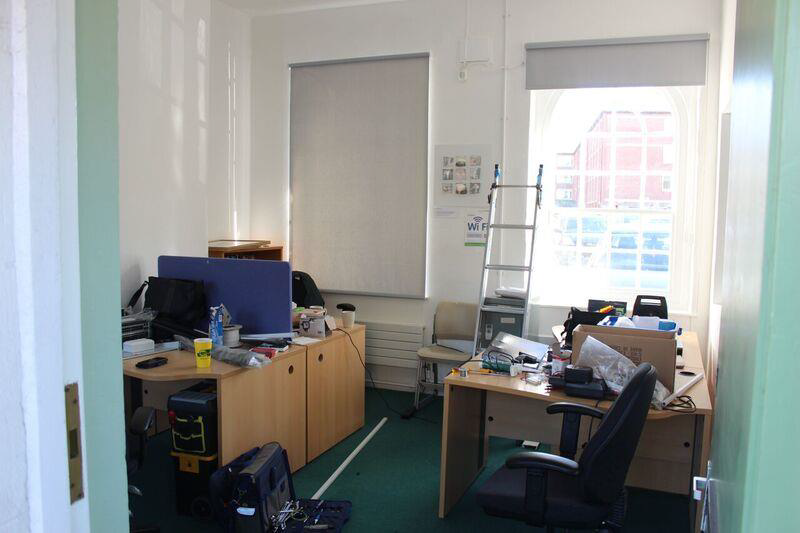 We also have a very well furnished office area with several desks and comfortable chairs. We have been welcomed by the other occupants of the Little Keep, many of whom have expressed a great deal of interest in the project and offered support with gaining both funding and helping to publicise our station. 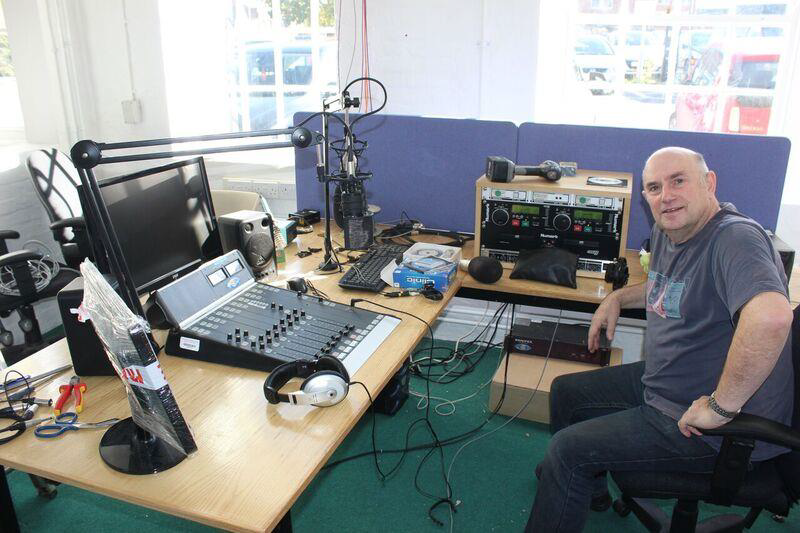 We still need some additional equipment for the station, if you have recently upgraded your PC and have an older machine that is surplus to requirements we might have a use for it as we need PC’s for both the studios and the office area. This area will house the office and a partition will be built to form studio 2. You can see the furniture that will be in the office area. We are looking for a local carpenter who would be prepared to install a fire door between studio 1 and the office and eventually we will also be erecting stud work to divide the office area and create an area for a smaller production and on air capable studio. If you know anyone who would be prepared to donate their skills in return for sponsored promotions when the station starts broadcasting please pass on my contact details. Update: I have had a friend of mine come forward and volunteered to fit the fire door between the studios. View of Studio 1 from the area that will form the smaller studio 2. 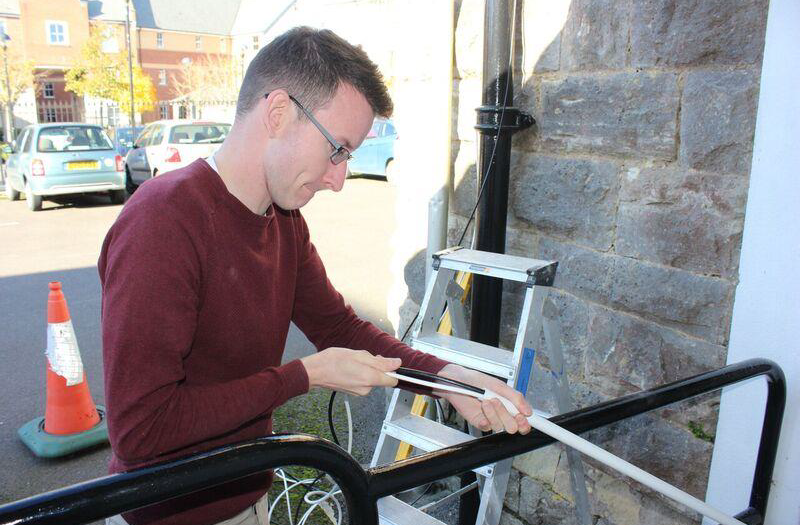 This week Rob plans to fit the double glazed panel in the opening you can see in the picture. How do I become a member of RCR CIC ? We plan on organising a directors meeting in Early November. This will be followed by the meeting for potential members / volunteers. Both of these meetings will take place at the Little Keep studios and we hope that by then the main studio installation will be well underway so that you can all see what facilities and space that is available. If you would like to help with the construction of the studio please contact us here. We plan on asking local schools to encourage students to design a station logo. We will be offering an art related prize for the winner and the winning logo will be used on all of the stations publicity material, signage and stationary.